Built on our award-winning BeyondRAID technology, the Drobo 5N2 protects your data without any intervention – even in the event of multiple drive failures. You can even switch from single to dual disk redundancy with a single click, ensuring enterprise-level dual parity data protection when required. Drobo’s with BeyondRAID are also self-healing and have virtual hot-spares. 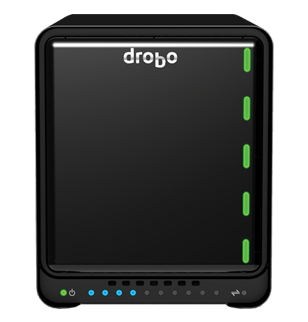 If a drive happens to fail, Drobo will automatically re-layout the data to return to a protected state without disruption. Usually reserved for larger enterprise-class storage solutions, the Drobo 5N2 gives you the option to implement Hot Data Caching through the Drobo Accelerator Bay. This feature intelligently uses high-performance flash to accelerate performance, allowing the fastest possible access to your data. 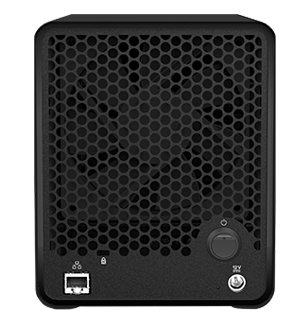 To keep capacity of your Drobo 5N2 at a maximum, the Drobo Accelerator Bay accepts an industry-standard mSATA SSD, leaving all five 3.5” drives bays available for high-capacity HDDs. The myDrobo platform provides end-to-end secure access to services on your Drobo from the public internet, through a user chosen mydrobo.com address. It enables services such as DroboAccess, Koken and WordPress to be accessed remotely in a secure fashion. DroboPix allows secure and automatic uploads of mobile photos and videos. With DroboDR you can set up a pair of 5N2s to automatically make an offsite copy of your data. Simple to set up and manage, the reliable DroboDR seamlessly replicates your data to another 5N2 ensuring data availability in case of disaster. Even better, the remote 5N2 stores all user account information so recovery is painless.